Best Buy's Memorial Day Sale debuts with several Apple deals and if you've been eyeing one of the company's products, now would be a good time to check out the US retailers online store. Since we've already reported on the Apple Watch Series 3 deals, let's take a look at what other Apple products Best Buy has on sale. The iPad Pro 10.5-inch, the latest tablet model launched by Apple has just received a $100 discount at Best Buy. The Wi-Fi version of the iPad Pro 10.5-inch usually sells for $650, but Best Buy offers the slab for just $550. 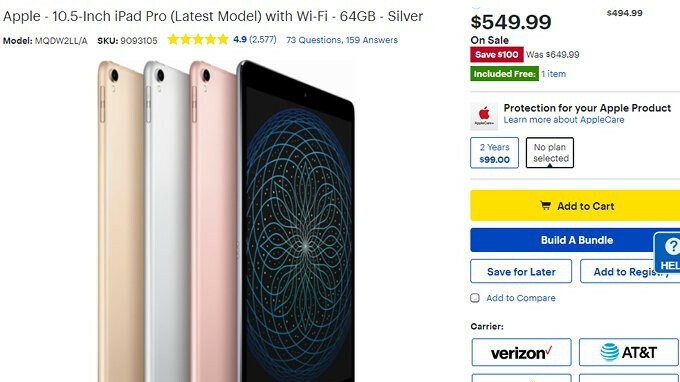 If you're looking for the Cellular model, the Verizon-branded iPad Pro 10.5-inch is on sale at Best Buy for $200 off, but you'll have to commit to a two-year agreement. If you're undecided, you'll be pleased to know that Best Buy is running these deals from now through Monday, or until stock runs out. Also, don't forget to check out our iPad Pro 10.5 review for an educated buying decision. Bought my iPad Pro 10.5 64GB Wifi Space Grey @ Target on a PM from MicroCenter for $499+taxes. Better yet, used my $500 Xfinity Mobile gift card and cost me only $39 only in taxes. An iPad Pro for $39 is the best deal of the century. When you pay $1250 with tax for a 256 GB iPhone X like CreeDiddy did. Then they should included a free iPad pro with every purchase.